Select any item or below to expand. Why do we care what you pay for your medications? That’s pretty straightforward: we have seen patients skipping their medications or reducing their dose in order to save money. This puts their health at risk and in some cases is a very serious danger. The more we can ensure that you can afford your medications, the better you will stay with the prescribed therapy and the more you will stay well. Most people (except those using Medicare D) don’t have any role in choosing the prescription insurance part of their health plan. Their employers’ benefit administrators sometimes focus more on the medical benefit than the prescription benefit because the medical benefit can mean large dollar figures for each event. But stop and consider: if you visit the doctor only once or twice a year, for routine office visits, the catastrophic part of your insurance doesn’t kick in. Yet you may be using a handful of different medications that you fill every month. Those medications may be what keep you healthy and well and they are not to be discounted as unimportant. If you don’t take your medicine, no amount of sitting talking to a doctor is going to fix you. The doctor picks the right one but it’s up to you to take it to stay well. You need medications to be affordable but also easily available and you need to be able to resolve problems such as dose changes quickly and correctly. Here’s how your prescription insurance works. Your employer (or other benefit provider) contracts with an insurance plan and that plan typically contracts withanother company to manage the prescription benefit: this company is a Pharmacy Benefit Manager or PBM. We work with these companies every day at the pharmacy, but most members of the public aren’t even aware that they exist. They have names like Catalyst, Medco, Caremark, and so on. When you call your health plan, you don’t talk to anyone in those companies but that’s who we have to wrestle with when your prescription claim is rejected or delayed. Your health plan has some control of the drug coverage: they often dictate a formulary of drugs they will cover, and they determine many (but not all) of the details. The hire the PBM to administer it all. If you think about it as insulation, it begins to look very cozy for everyone but you and us: the employer hires someone who hires someone else who hires someone else to receive the prescription drug claim. 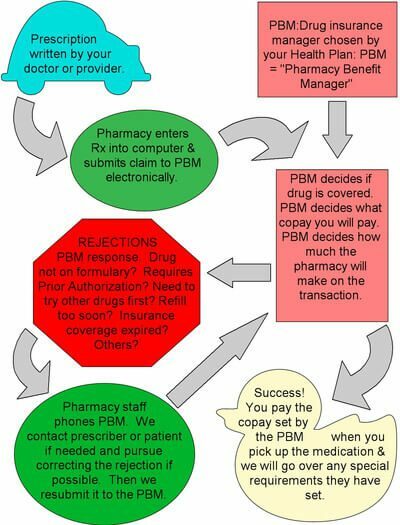 The last someone else (the PBM) still doesn’t have to face up to you when there are roadblocks: they leave that to our pharmacy staff. Ok, enough background. When I get time, I’ll write up a description of the details, so check back in future. For now, scroll down to the bottom section or click Generic Substitution for a little more info…. Medicare’s drug coverage program is administered by private companies under contract with the government. You can join no sooner than 3 months before your 65th birthday and up to 3 months afterward. Beyond that, you can always join Medicare D, but there is a chance you will be assessed a penalty for delaying. The penalty is proportionate to the number and costs of the drugs you use. [Click here] for more details on Medicare D.
Some insurance plans or employers are pushing their clients to use the mail-order pharmacy affiliated with or owned by the insurance provider. Sometimes the tactic they use is a cost incentive: they offer you a 90 day supply for the same amount you would pay at a real pharmacy for a 30 or a 60 day supply. Or other cost incentives that can be set up by the insurance provider to steer you to their own pharmacy mail center: cost incentives that real brick-and-mortar pharmacies are not permitted to access. Sometimes they send letters or make phone calls to patients “recommending” or “requesting” that they use the mail order option. Sometimes they force patients to use their mail order pharmacy in order for the drug to be covered. Patients can still fill drugs at a real pharmacy but their insurance will not help pay for them. This is where our discount card and our $5 generics club are helpful. They can take a somewhat manipulative tone but remember: you always have the choice of where to fill your medications. They may “ask” you to fill them with their pharmacy, but this is no different from us “asking” you to fill them here. It’s because that company wants your business, just as we do. We are a fully independent Decorah business owned and operated here. The mail order center location? You’ll have to take a guess based on the accent of their “next available representative”. One thing’s certain: nothing you send to a mail order service is going to help your regional Iowa community. Every dollar you spend at a mail order pharmacy is a dollar that has left Winneshiek county forever. It is important to realize that the special cost savings offered by mail order pharmacies are NOT available to real pharmacies. These are deals worked out within the insurance company or pharmacy benefit manager and they do not permit us to sign on to the same deal. This is not what we consider fair competition and the only way to address it is for members who use the insurance to demand a change. We consider it wrong and unsafe to force patients to choose between reducing their costs and protecting their health by using a local healthcare source like our pharmacy. Bottom Line: Does mail order pharmacy save you money? Sometimes. Sometimes not. It depends on your particular plan details and on which medications you use. Sometimes your copays are lower and it all looks good but then they are late delivering something you need. If you end up having to pay cash prices for it (because the mail order pharmacy has already submitted it to insurance), then your savings can disappear in a hurry. You can also lose if products are damaged in transit or by temperatures in Iowa’s winter chill. If an error is made at the pharmacy (we’re all human, even mail order pharmacy staff! ), then it can be difficult or slow to get it fixed. You will have to work it all out by telephone, which is a hassle. It’s hard to put a price on things like safety, hassle or delay. Sometimes the medication does not arrive on time. I spoke with a patient who had run out of her medication a day or two before and when I phoned the mail order pharmacy to transfer the prescription to us so we could fill it, I was told they had mailed it just that morning. Yet they had submitted the claim to the insurance a full 3 weeks before! The representative told me that this is not unusual: their initial materials explain to the patient that this type of delay is possible. I can tell you this: If I submitted a pharmacy claim and then didn’t dispense it for 2 or 3 weeks, I would be in big trouble with my patients and probably with the insurance company too! But they can set different rules when the insurance company owns the mail order pharmacy. Some mail order pharmacies will fill your medication automatically and mail it out to you. There have been cases where this was continued well past the patient stopping use of the medication. Patients have brought in literally thousands of dollars worth of medication for us to destroy, which was sent to them by over-eager mail order programs. Even if the patient’s copay was low, that is still a tremendous waste of healthcare dollars and of medication. More to come on safety problems with mail-order pharmacy and other concerns…. MAX Card: Separate from the $5 generics program, we also have a MaxCare discount card that will shave a few dollars off of most prescriptions and can help this those not covered by the $5 list. The discount is larger for some drugs than for others but doesn’t provide any advantage over an existing insurance copay. Note that if your prescription plan has a deductible, you can only work it down by submitting the claim to them. If we were to use a discount card or savings club, it might cost you less but you would get no credit toward your deductible, so it would just work against you in the end. Coupons: We occasionally have coupons for brand drugs that will save a patient quite a few dollars. Coupons are also available at many drug company websites, so be sure to look online to see if you can find some. Some doctor’s offices have coupons they can provide too. Caution: many/ most drug coupons are excluded from use by patients enrolled in any government sponsored drug coverage. So if you are on Medicare D or on Medicaid, those coupons may not be available for your use. Just have to read the fine print. Patient Assistance: We have several resources to help you find patient assistance programs which could cover part or all of the cost of some expensive brand medications. Often run by the drug companies themselves, these can mean very big savings for those who qualify. Eligibility usually depends on family income and the absence of other insurance coverage for the drug. Some patient assistance programs are designed for lower income uninsured patients and are operated separate from the drug companies. If you have a hardship in paying for your medications, please ask us to provide you with some of these resources. A good website for seeking these programs and similar resources is NeedyMeds.org. I would suggest you start there. You can search by medication name and it’s very easy to get started. Before someone asks: We have not tried the discount card they offer there, but we’d be glad to. I don’t know if it will be much better than the Max card we have here. Possible, but I don’t know. You’ve heard of the $4 generics program that some big box pharmacies offer. Well, this is similar. This is a Healthmart program for people without insurance or whose insurance forces them toward mail-order or excessive copays. It works only for drugs on the list (same list as the one They use for their $4 generics program) and it provides a 30 day supply for $5 right here at Donlon Healthmart. 90 days supply for $14. Keep in mind that the list dictates how many pills is considered a 30 or 90 day supply. The program is a club, so you must sign up. There is an annual fee of $11.95 but we can cover that for uninsured patients whose income places them in true need: please ask to discuss it with one of our pharmacists. Each sign-up covers all members of the patient’s household as well, so one card will work for everybody. High costs play a role in many interrupted therapies which can result in compromises to your health. If your medications are covered by insurance, then the insurance plan dictates your copays, not the pharmacy. If an FDA approved generic equivalent exists, we will automatically use that to fill any new prescription, with very few exceptions. We will always let you know if we have done this or if we are considering it. You have the final say in what we fill, though your insurance plan has the final say in what you pay for it. FDA rates generics as equivalent to a brand only if research has shown that the generic contains the same amount of active drug and that it has the same resulting activity within the body. There is also a host of safety & production requirements that must be met by the manufacturer. FDA reviews manufacturers all over the world and will shut down their approval if they do not pass inspection. This sometimes results in shortages. If one of your regular (brand) medications become available in a generic equivalent, we will ask your permission before we change you to the generic version. If you’re one of the patients we know well, we may make that change before you stop by and explain it to you at the time of pickup. (You can always ask for the brand medication instead, keeping in mind some of the points below.) This quick changing to generics is an important way our pharmacy keeps your costs down. Our pharmacists are glad to start a dialog with your physician to explore appropriate alternatives that would cost you less. Sometimes we can get this taken care of without your needing to see your physician at all. If you do not have insurance or if there are other issues, we have a few options to help you pay less than the cash price, including a $5/month program (uses the same list of medications as Walmart’s $4 list) or a discount card that shaves a few dollars off of most generic medications. We can also help connect you with manufacturers’ patient assistance programs or other programs for those who cannot afford their medications. See other sections of this page. We honor all drug manufacturer coupons you may bring in: several brand medications offer coupons on their websites. We have a limited number of coupons here that we try to use for those patients who need them most. Generic medications usually have a lower copay than brand medications, though, at initial launch, a new generic may be priced very close to the brand drug. Generics must be rated as “AB” equivalent by the FDA: equivalent not only in the type and amount of drug present but in the results: the amount of action or benefit from taking one. When a generic is new, it may take some time before there are enough different manufacturers competing on production to bring the prices down, so it may take some time before insurance companies recognize the generic and charge a lower copay. Eventually, most plans will require that either the doctor or the patient demand use of the brand if they are going to accept the claim. Often even then the copay will be considerably higher. If you ever have any sort of concern about any aspect of the medication we have provided to you, PLEASE call us immediately. We do not want you to feel anything but full confidence in what you are taking and our pharmacists are glad to talk with you about any type of question. Sometimes the question that seems trivial to you is very important, so give us a call!